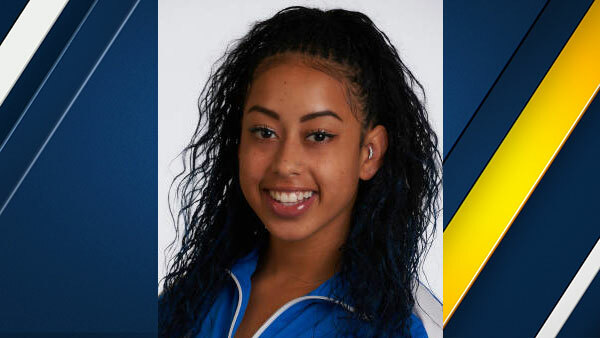 WESTWOOD, Los Angeles -- A UCLA gymnast from Temecula is burning up the Internet with a floor performance that blended in hip hop dance moves with her tumbles and flips to win her a huge fan base online. A video of Sophina DeJesus' routine has already hit 26 million views and climbing since Saturday's meet at Pauley Pavilion. DeJesus said she started working on the routine over the summer and sought advice from her sister and a professional dancer among others, hoping to come up with something special for her senior year. The result was a performance that incorporated popular dances like the Whip, the Nene and the Dab in between her more traditional gymnastic moves. The judges gave her a 9.925 score, as she helped UCLA beat Utah in the meet by just 0.025 of a point. "I was just excited to finally compete floor, so I wanted to go out there, have fun and perform," DeJesus told the Pac-12 Network. "I love dancing and I love peforming. So that was the main goal, to go out there and hit a good one for my team." DeJesus got her start as a performer on the children's show Hip Hop Harry with her sister and credits the show for her love of performing. "One of the best experiences I will ever have for sure," she said. "I think it made me the gymnast I am today. Because I performed on 'Hip Hop Harry' and I love acting and I love dancing and I incorporate all of that into gymnastics."